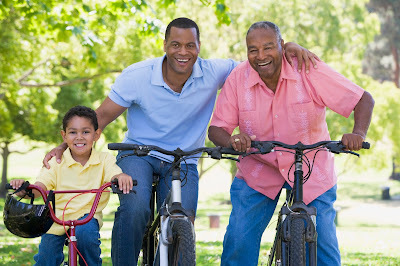 Men - fathers, sons, grandfathers, husbands - We celebrate Father’s Day on June 19th this year; but also, the entire month of June has been designated as “Men’s Health Month”. The purpose of Men’s Health Month is to increase awareness of common preventable health problems, help men avoid them by encouraging early detection testing, and learn how to maintain good health by doing things that contribute to good health. …good healthy lifestyle choices. Because, as we’ve all heard “An ounce of prevention is worth a pound of cure”. And, as we often say at Health2Go: It is all the little things we do each day that make a big difference in time. The Centers for Disease Control (CDC) has determined that Heart Disease is the #1 cause of death for men (and women) in not only the U.S.A. but the world. That alone is a striking fact, but men are almost twice as likely to die from heart disease as women. So Men, let’s take on the biggest health problems first – heart disease, cancer and stroke. The top risk factors for heart disease are gender and age, which we cannot do anything to control; but we can dramatically reduce the risk of heart disease by eating a healthy diet and exercising and maintaining DHEA level. Interesting new research about heart disease has shown that contrary to conventional belief: cholesterol level is not as problematic as poor diet, lack of regular exercise and chronic inflammation. DHEA is the only thing in the human body that counterbalances the harmful inflammatory effects of high cortisol levels. Dr. John Woodward, MD says “For optimal health, the DHEA to cortisol ratio should be 10 to 1. So to reduce the risk of heart disease, eat a diet high in fresh green and colorful vegetables, exercise every day, and apply Twist 25 DHEA cream daily to reduce inflammation and support cardiovascular health. The #2 killer for men is cancer. A healthy diet and exercise and maintaining good DHEA levels has been shown to significantly reduce the risks of cancer. The #3 cause of death for men is stroke. A very important risk factor for stroke is hypertension (high blood pressure). So it makes sense that controlling high blood pressure is crucial to reduce the risk of stroke. Conveniently, it turns out that the behaviors we have just described above that reduce the risks of heart disease and cancer also reduce the risks of stroke. So let's all celebrate Men’s Health Month, by helping men stay healthy, active and alive by encouraging eating a healthy diet high in a wide variety of green leafy colorful vegetables, getting some exercise for 30 minutes to 1 hour every day, and applying Twist 25 DHEA cream daily. Happy Father’s Day and have a great Men’s Health Month!